Students of Industry Analysis will note the importance of high technology industry analysis firms, like International Data Corporation (IDC), which this week issued its quarterly reports on the state of key technology markets. The report has today been seized upon, sliced and diced by the Wall Street Journal, and a host of other media sources. The technology blogosphere is alive with comment, PandoDaily, Gigaom, TechCrunch, Gizmodo have all been furiously offering their own spins on the IDC Report. It is amazing to see so much of the industry talking about nothing else but IDC today. Similar firms like Forrester, Gartner and others offer similar industry analysis reports, but IDC is the big dog, and the mobile market is their dog food. 1. Microsoft’s Windows Phone is going nowhere fast at 3.7% market share. Microsoft shareholders are rumored to be agitating for change, and Steve Ballmer’s head may be on the block. Without Nokia’s support, Windows Phone would have an even smaller share of the market. Microsoft’s catastrophic blunder with Windows 8 has only added to their woes. IDC had previously correctly predicted this in 2012, which shows the reason for the immense interest in the IDC report. 3. The tablet market is a very different market from smart phones. It appears to be driven by the emotional devotion of iPad users, The entire tablet market seems to move on Apple’s moves, and the lack of any new iPad launches has depressed the entire market, This could suggest, as Blackberry’s CEO has said, that the tablet is not really a viable market. It may be squeezed between smart phones and the residual laptop market, and eventually disappear. Google Inc.’s Android software continues to steamroll the competition in smartphones, posing bigger problems for companies like Apple Inc., Microsoft and BlackBerry Ltd.
New data Wednesday from research firm IDC found that Apple’s share of the globalmarket slid to 13.2% in the second quarter from 16.6% in the year-earlier period. Handsets running Android, meanwhile, jumped to 79.3% from 69.1%. The signs are particularly ominous for one-time market leader BlackBerry, despite some high-profile product announcements recently. Devices running its software accounted for just 2.9% of global smartphone shipments in the three months ended in June, compared with 4.9% for the same period in 2012. Android is given away free to handset makers by Google, whose strategy is to make money on advertising associated with mobile devices. It has long powered smartphones offered by industry giantSamsung Electronics Co.,005930.SE +0.08% but has lately also benefited by Chinese companies such as Lenovo Group Ltd., 0992.HK -0.68%Huawei Technologies Inc. and ZTE Corp. that are grabbing a bigger chunk of the smartphone market. Market share, of course, isn’t the same thing as making money. Apple earns more profit from its iPhones because it can charge more than rivals can. Its average sales price, excluding any carrier subsidies, was $710 in 2012, compared with an industry average for smartphones that year of $407, IDC estimates. Samsung, which is No. 1 by unit shipments, and No. 2 Apple account for essentially all the industry’s profit, Canaccord Genuity estimates. The firm puts Apple’s second-quarter smartphone operating profit at $5.99 billion, with an operating margin of 33%; it estimates Samsung’s profit at $5.63 billion, or 19%, including both smartphones and other handsets. Many others are losing money in the business, it estimates. But high prices aren’t helping Apple’s share in some markets, said IDC analyst Ryan Reith, especially in some developing markets where most smartphones get sold for $390 to $450, he said. Apple, which is expected to announce new products this fall, has also suffered from the lack of new handsets to drive demand now, Mr. Reith said. Apple’s shipments did grow 20% in the second period, IDC said, though lost share because the smartphone market grew more quickly. An Apple spokesman declined to comment. 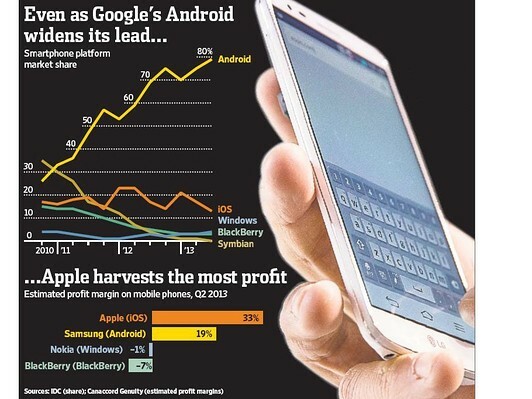 BlackBerry, which launched its new operating system in January, was overtaken as the No. 3 supplier of smartphone software in the second quarter by Microsoft Corp., whose share in smartphone software grew to 3.7% from 3.1% last year. The Canadian company accounted for roughly a fifth of smartphone sales in 2009. But the impact of its new line of phones has been slight so far. A BlackBerry spokesman declined to comment. Integrated Big Data, Cloud, Smart Mobile: Big Deal or Not?